NOTES, DISCLAIMERS, AND EXPLANATIONS More information on the strange and obtuse symbologies, themes, and policies of this Webspace. with any, government, movement, sect, club, fraternal organization, religion, cult, or other supra-individual entity. In particular, this Webspace is unaffiliated with, and independent of, any organizations with which Dr. Whitaker is otherwise associated, including: Logicon Technical Services, Inc.; Northrop Grumman Corporation; the United States Air Force; Umeå Universitet; and The Human Race (a.k.a. : Monkeys with Brains). I fully expect freedom of personal expression in cyberspace. These Web pages represent my own opinions and eccentricities. Nothing you see here should be attributed to Umeå Universitet, Logicon, Northrop Grumman, the United States Air Force, or any other entity -- real, fictional, virtual, or simply lurking in the shadows monitoring your visit to these Web pages. I've invented a fictive methodology labeled anagramancy - divination by analyzing permutations of the subject's name. Try it -- it's fun! "Dare Think Awry!" When I recently processed permutations of my name through an anagram generator, I obtained a number of intriguingly pertinent phrases. The picture discernible from the resultant fragments is presented in the free verse(?) posted on my Home Page. Some might call Enola Gaia my free-floating signifier or my guiding meme. I think of her as my totem... The B-29 bomber Enola Gay was the vehicle for the world's inaugural nuclear attack on Japan. Enola Gaia connotes an envisioned vehicle for something considerably more global and more benign. All my computers have been named Enola Gaia, and I use this label as the rubric for all my private work. 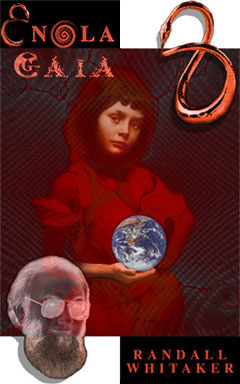 The canonical Enola Gaia logo image is Alice Liddell - the real Alice for whom Lewis Carroll wrote his Wonderland stories. The particular image used is an 1859 photograph of Alice (by Charles Dodgson, a.k.a. Lewis Carroll) as a study on the subject "The Beggar Maid". This photograph was subsequently used as the basis for a colored picture presented as a gift to Alfred Lord Tennyson in reference to his popular poem of the same name. The Ouroboros is an ancient symbol of circularity, cyclicity, and hence infinity. Any reservations are noted on the individual Webpage. Your Monkey's on Fire Dare Think Awry!